US actress Georgia Engel best known for The Mary Tyler Moore Show has died, aged 70. She died on Friday in New Jersey but the cause of death is unknown. 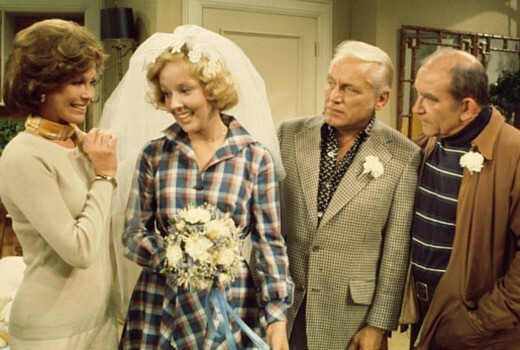 Engel (pictured second from left) played the soft-spoken Georgette Baxter on The Mary Tyler Moore Show from 1972 – 1977, first becoming girlfriend then wife to Ted Baxter (Ted Knight). She also enjoyed had recurring roles on Everybody Loves Raymond and Hot in Cleveland from 2012-2015, earning several Emmy nominations across her career. Other credits included Rhoda, The Love Boat, The Betty White Show, Mork & Mindy, Goodtime Girls, Fantasy Island, Coach, Passions, The Office and Two and a Half Men. There were also Broadway performances and films including Taking Off, Dr. Doolittle 2 and Signs of Life. She most recently appeared on One Day at a Time on Netflix. The Mary Tyler Moore Show and Georgia’s character were notable for being good-natured and genuinely funny in an era of nasty American sitcoms where controversial issues were often thrust onto unsuspecting viewers. While All In the Family had the lead actress being raped and a character being blown up in his car, Barney Miller had a character acting like a werewolf, Welcome Back Kotter had a character disowned by his parents and Good Times had characters living in poverty, you could tune into MTM knowing that you could get a laugh in every episode. Georgette was a new character in the show who fitted in seamlessly like Betty White who played Sue-Anne Nivens. Normally when a new character comes into a show it is a jump the shark moment but as MTM evolved they enriched it even further. So sad. The Mary Tyler Moore Show is one of my absolute favourites. RIP Georgia. Very sad news.I remember her well from The Mary Tyler Moore Show.70 seems so young to die.RIP Georgia. Sad. i remember her well in the Mary Tyler Moore Show. Rest in peace Georgia.